There are definite encouraging signs of positive development and growth in UK comics, with an increasingly full calendar of events, festivals, and conventions up and down the country drawing big names (Chris Ware, and Joe Sacco were at Edinburgh’s Stripped festival a month back, Scott Snyder will be in Dublin at DICE this weekend, the upcoming Lakes Festival sees a host of creators travel to the district), UK publishers such as Jonathan Cape, Blank Slate Books, and Self Made Hero not only translating excellent bande dessinee, but focusing on nurturing home-grown talent as well. It’s difficult to predict how it will all turn out, but it’s honestly quite an exciting thing to see and be part of. Earlier this year, another piece in the UK comics scene jigsaw was slotted in, as online distributors Impossible Books quietly set up shop. With the US postage hikes pricing people out of buying directly from creators themselves, and many stores having a small or tucked away corner for self-published/small press books from North America and Canada, Impossible are filling a substantial gap in the market. Founded by Camila Barboza and Taylor Lilley, both of whom work in comics retail for Orbital Comics, they offer a wide range of fantastic comics from outfits such as Koyama Press, Oily Comics, Retrofit, and creators including Michael DeForge, Jordan Crane, Roman Muradov, Michel Fiffe, Noah van Sciver, Lilli Carre and more, providing a very cost effective, weight-based postage charge service. Barboza has some background with running labour-of-love initiatives, as the owner of a small, independent record label dedicated to producing limited-run, hand-packaged releases, and is a regular figure on the gig/comic/zines fair and festivals circuit, usually with her camera. 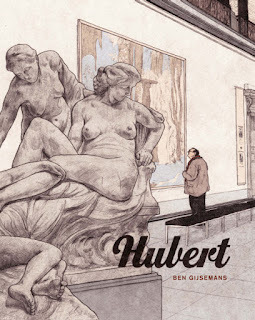 Here she and Lilley discuss how the idea of Impossible came about, how they choose which comics they’d like to stock, the challenges associated with the operation of a comics distro and their future plans. 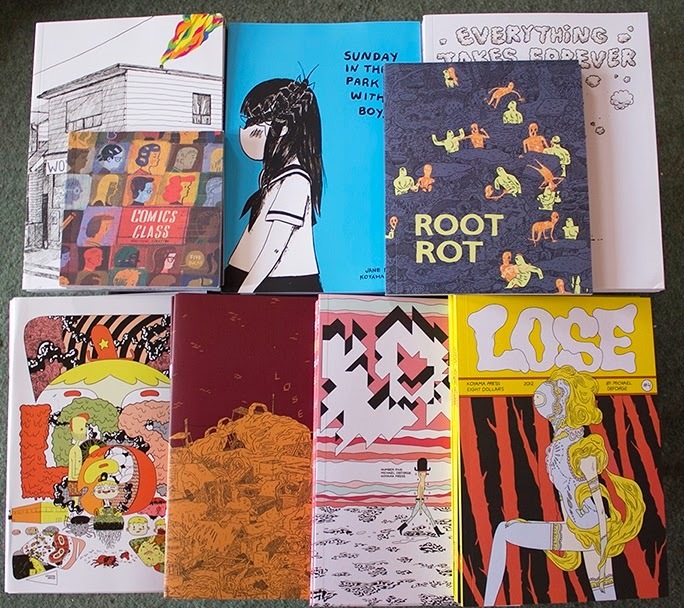 It’s fantastic to have an accessible space in the UK for small press goodness, particularity with shipping costs increasing everywhere and only certain shops stocking them (and even then limited in titles and quantities). How did the idea for Impossible books first come about? Camila: The idea came pretty much from what you have just pointed out: the extremely high postage rates, and the lack of availability of international independent comics in the British market. As someone who used to order directly from creators and small publishers on a regular basis, I had been in the situation where you order a $5 comic and end up paying almost twice that much in postage way too many times. I guess we wished somebody would set something like this up, but we got tired of waiting and decided to do it ourselves. Taylor: I think also, we were both spending so much time looking around for what’s interesting and new, for ourselves and other people … it made sense to put that to a better use than just the occasional recommendation. Can you talk a little about how you set up, e.g. getting in touch with people, the website, getting comics together? Camila: We started by contacting a couple of small publishers we wanted to stock, and before we knew it, the word had spread and others got in touch with us too. We were lucky to find a lot of supportive, helpful and incredibly nice people out there – Box Brown, Tony Shenton, John Porcellino, Leef at Mission Comics, and the list goes on and go, have all been immensely helpful! The two first packages we received were from Retrofit and Hic & Hoc. We both work in comics retail in our day jobs, so we’re used to opening boxes full of comics, but those two sure felt special. The website is powered by WordPress (one of the great wonders of the modern world!). We designed and built it guided by things we like in a number of sites we use ourselves. We still want to add a lot of other features to it, so I guess you could say it’s still a work in progress. Taylor: We counted on the legendary helpfulness and supportiveness of the comics community. And they came through! I’d also mention JT Yost of Birdcage Bottom Books, and the folks over at Bergen Street Comics, but like Camila says, people responded way better than we had any right to expect them to. As for getting comics together, its hilarious, and involves semi-regular night-time trips to retrieve books we thought we had copies of! My favourite part of it is inventory, when we get to spread the stock out and kind of bask in comics. It makes it easier to say goodbye when they go. How do you decide which comics you want to stock? Camila: Impossible is a pretty small operation, and we can’t stock every single indie comic out there, so we have to be selective. Our main rule is that we both have to agree on a title before deciding to stock it. Most of what we’re stocking at the moment are titles by creators whose work we already admired before, or things we discovered (and fell in love with) while we were setting up. Do you deal directly with the artists or with the publishers themselves? Taylor: It varies. Part of the model we’re running on is scale, so if we can order more titles from one source, everything runs a little smoother. But there are things like Antiques Roadshow or any of Caitlin Skaalrud’s work, where we went straight to the source because we fell for them, and had to have them. 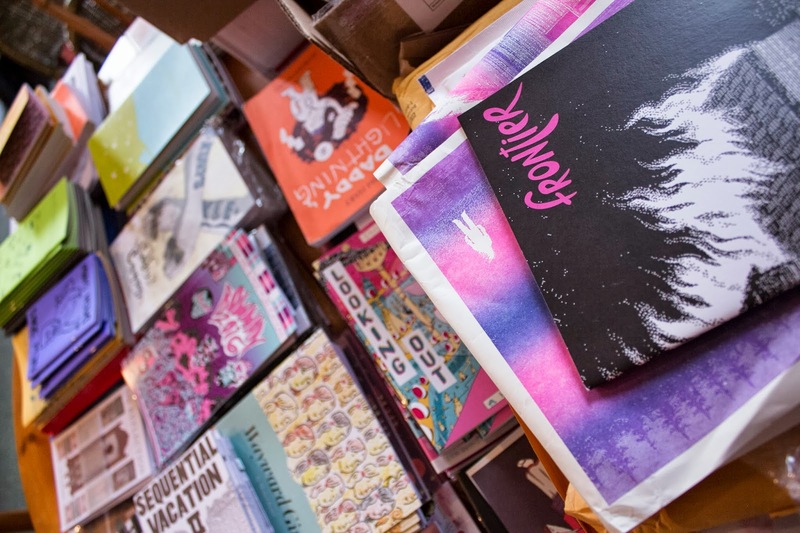 Ideally everything would go to the creators, but most of the people doing distro or publishing are running on enthusiasm and passion, so artists, publishers, distro… they’re all comics people. Camila: Pretty much all the UK based publications come directly from the artists as well. I think you guys are doing an awesome job, however, distribution outlets (esp comics) are incredibly time consuming and to put it frankly, not very financially viable. So why set up? Taylor: They do say the Devil makes work for idle hands, don’t they? Your description, “incredibly time consuming and … not very financially viable”, applies to comic-making as well, for all but the stratospheric few. We do it for all the reasons makers make, to put something we believe in into the hands of people who want to believe. I know you’ve only been up and running a short time, but how would you assess the experience so far? Any problems or any aspects of it you perhaps didn’t expect? Is it going how you imagined/expected? Taylor: Intense. It has been intense. I hadn’t anticipated the sheer range of things there would be to do, or the ongoing nature of doing them, in terms of making listings and some of the site-oriented stuff, or more creative work like adverts and blogs. There haven’t really been any problems, though (yet!). I think one of our biggest challenges is to awaken the sleeping giant of those-who-like-comics-but-don’t-yet-know-it. Ring them bells! Camila: Agreed, it sure has been intense, but it’s also been a great experience and we’re having a lot of fun in the process. We’re still trying to find a way around our biggest problem – extremely high postage rates. We knew exactly what we were getting into from the start, but we were hoping (are hoping?) we’ll be able to find better ways to get stock across the seas. Do you have any plans to go into publishing once you’ve established yourself a little more? Taylor: Um, is it hot in here? Camila: Not really. I’m not saying that could never happen, but at this stage, it’s not something we plan on doing. Any future plans for Impossible books? Any plans to table at any cons or events? Camila: Right now our priority is to keep expanding our stock, and we’re just about to start working as a distro for British comics to the States. Again, at this stage, we don’t have plans on doing cons and events, but that may change in the future. We’re just trying to concentrate on a thing at a time and see how it all goes. 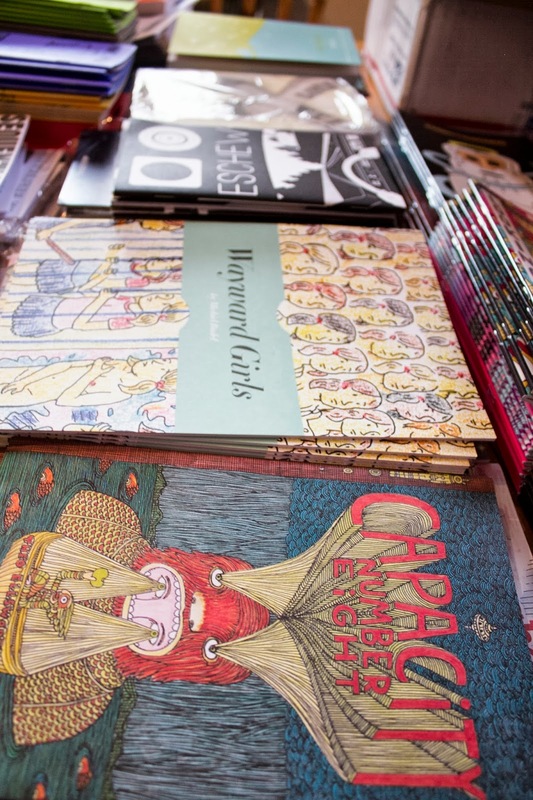 Taylor: It would rock to table at TCAF. But yeah, one thing at a time! Many thanks to Camila and Taylor for their time. All photographs used in this article are the property of Camila Barboza.